Seed marker in soil. Credit Kelly Sikkema, Flickr. Smallholder farmers produce an estimated 80% of the food in developing countries. Most smallholder farmers have little access to power or inputs, and rely upon rudimentary tools. The application of inputs, such as seeds, water, fertiliser or pesticide, is often imprecise. Precision agriculture has emerged as an approach to apply inputs at the right place and rate in the field, and as close as possible to the optimum crop growth stage. 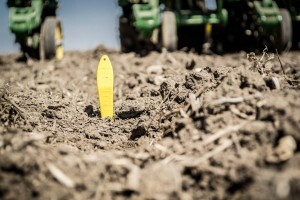 One such method of precision agriculture is correct seed spacing. Seed spacing is the distance between seeds in a given row and the distance between rows. Whilst traditional sowing methods in sub-Saharan Africa, such as manually dropping seeds into soil or dibbling (making small holes with a stick and dropping in seeds by hand) allow for each seed to be placed in a row, broadcasting is the sowing of seeds across an area by scattering. Germination rates tend to be poorer with broadcast planting, and farmers may try to compensate by using more seeds. Yet, higher seeding rates typically result in more money spent on seed inputs without the gain in yield. Poor seeding rates from broadcast planting normally result from poor seed to soil contact, seeds being covered too deep, predation from birds and small mammals or the crowding out of plants. Seedlings can be of poor quality due to a high population of weeds and competition for available moisture. In contrast, planting seeds in rows or straight lines by drilling or dibbling enhances yield potential and improves convenience for activities such as weeding, nutrient application or harvesting. An east-west row orientation is preferred to maximize light absorption, but this is not always possible. In many cases the shape, terrain and slope of the land, as well as other barriers, dictate the row orientation.An alternative to row planting is sowing seeds in a random but well-spaced manner. A study in Zambia found that women using the Chintipantipa method (a Lamba word used to describe a traditional method of planting crops in a random or haphazard manner) are able to plant sorghum and groundnuts in a regular and reasonably equidistant way. The more spatially uniform a crop is planted, the better the crop grows and the easier weeds are suppressed. “Clumping” (the uneven clustering of plants in some areas with other areas left relatively sparse) can decrease the amount of nutrients available to each plant due to competition from its neighbours. Where there are large gaps between plants, weeds can grow more readily and compete with the crop species. The correct spacing of seeds is the prerequisite for other Ecological Intensification methods, such as microdosing or multiple cropping. Water and fertiliser microdosing cannot easily occur if seeds are broadcast, as it is harder for farmers to apply inputs. Multiple cropping also cannot occur when seeds are randomly placed, as the method requires that seeds be planted in rows. Planting seeds at the correct spacing allows for land to be used most efficiently as crops are given the necessary access to nutrients. This in turn, increases the overall yield with a minimum seed input requirement. Farmers can maximise their profits though an increased yield and reduced input costs. Correct seed spacing allows for crops to receive the maximum light exposure by reducing the excessive shading of other plants that occurs when seeds are planted too close to one another. 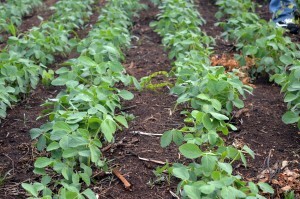 This allows for more efficient photosynthesis and improved crop yield. Sweet potato yields can be affected significantly by shading. One study showed that the mean number of tubers per metre was 17 in direct sunlight, decreasing to 14 in 31% shade, 13 in 43% shade, 10 in 52% shade and just 2 in 67% shade. Shading also increases the number of days it takes for tuberous roots to develop, from 36 days in full sunlight to 49 days in 67% the shade. Correct seed spacing reduces competition for soil water and nutrients. Yet, different plant species require different spacing to optimise their nutrient’s uptake. For example, maize can develop roots, which grow to more than 2m deep, but the main branched system, where 80% of water and nutrient uptake occurs, is located in the first 0.8m. Rainfall levels and patterns as well as any irrigation practices adopted all affect the depth and rate of root growth. In addition to soil water and nutrient status, root development is strongly influenced by textural and structural stratification, salts and the level of the water table. Row planting allows easy access between rows, which facilitates weeding, cultivation and other operations, including hauling. When seeds are broadcast, it is not easy to weed between the seedlings, cultivate or remove crops when they are ready for sale. The increased access that row planting offers also allows for close inspection of individual plants, making it easier to track pests and disease. Finally, it is easy to count the plant population in a given farm area when planted in rows. Chintipantipa does not create the rows that facilitate cultivation, but crops are still well spaced so easier to access compared to broadcasting. 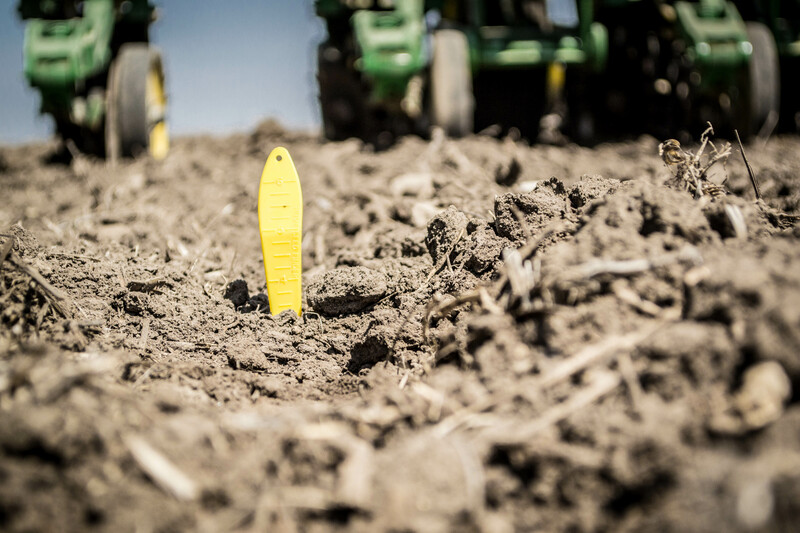 Correct seed spacing often results in higher yields, and the correct spacing required depends on the crop. A study in Ethiopia found that when farmers planted teff seed in rows at a low seed rate, yields increased on average by 70% compared to the national average. In contrast, increasing the number of maize seeds planted from the traditional 4,000 seeds per hectare up to 6,000 seeds per hectare increased the yield by 30%. Decreasing the maize row spacing from the traditional 90cm to 45cm resulted in an 11% higher yield. 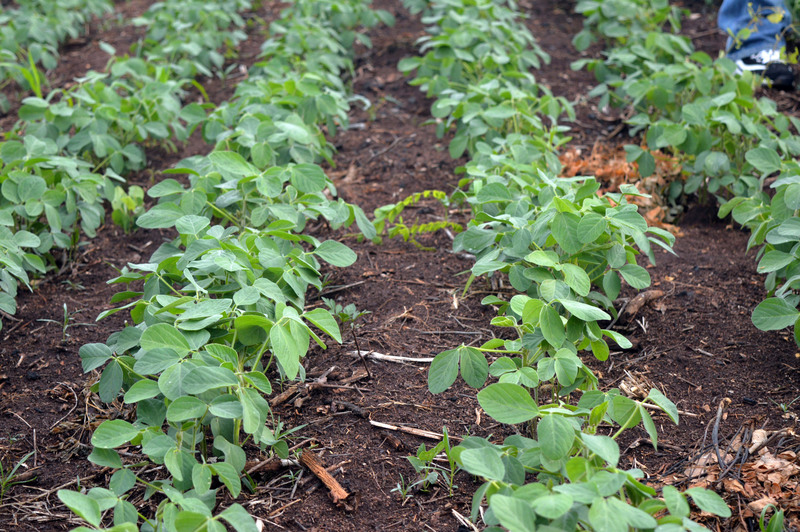 In comparison, neither groundnut nor sorghum trials in Zambia showed that row planting produced higher yields than the Chintipantipa planting method. Despite appearing haphazard, the amount of seed used and the final plant population achieved by the Chintipantipa planting method was in fact very similar to that achieved by row planting. Root depth and distribution requirements for each plant is determined by a number of factors, including soil type (such as maize roots avoid sandy layers in soils) and soil moisture (for example, in dry years roots will typically grow wider and deeper searching for water). Farmers need the right technical knowledge to be able to sow seeds efficiently and increase their yield by reducing plant and weed competition. Yet, in order to do this, farmers need access to training and extension services to help them better understand their crop requirements. Soil testing can also help farmers to better understand their soil properties. Farmers will also need access to training for row planting in particular, to help them better understand how to make the most of their field space. Broadcasting is the easiest of all sowing strategies, as all that is required is for farmers to scatter the seeds across their fields. However, broadcasting increases the weeding labour time due to the “clumping” of plants that almost always occurs. Monitoring crop health or targeting inputs also prove more time consuming than with uniform row planting. Row planting reduces the amount of weeds that grow compared to broadcasting, lowering weeding labour time. 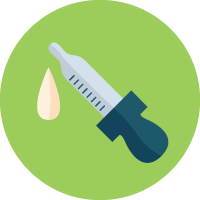 It also reduces the amount of time needed to apply inputs and facilitates the use of microdosing, which has multiple environmental and economic benefits. Despite this, row planting is the most labour intensive sowing strategy in sub-Saharan Africa. In developed countries, drill-seeding technology is available to help farmers mechanically place seeds into the soil. In sub-Saharan Africa, whilst the use of a hand hoe is the standard procedure for maize planting, less than 5% of land under cultivation in Africa uses more advanced mechanisation such as jab planters, rotary injection planters or ploughs for planting seeds. Jab planters reduce the labour time for planting from 7.5 days per hectare with hand planting to 2 days per hectare. Jab planters make a hole in the ground and plant the seed (and, in some models, seed and fertiliser) directly into it in one operation. This is more time efficient than dibbling and requires less labour than digging planting basins with a hand-hoe. However, jab planters cost about US$30 for a high-quality planter that usually lasts 3 years, which may discourage farmers from investing in the technology. An alternative simple technology uses string (called a teren rope in Zambia) in which knots or bottle caps are tied at the desired plant spacing distance to act as a guide for accurate spacing. The strings can be used again in following seasons. Marking out the correct spacing of rows gives the best plant population. To plant crops in rows, holes for the seed are dug alongside this planting rope. After each row has been planted the rope must be moved over and the process repeated. This ideally requires two people, one at each end of the rope. Those farmers do not have the help required to use these method, may be reluctant to use this method as it is can be difficult to do alone. Nwanze, KF 2011, Viewpoint: Smallholders can feed the world, IFAD Viewpoints, Rome [24 June 2015]. CropsReview.com 2015, What Is and How Crops are Arranged in Row Planting, [24 June 2015]. Russell, T 1997, Chintipantipa: is planting crops in lines always the best method? ILEIA Newsletter, vol. 13, no. 2, [24 June 2015]. Griepentrog, HW, Andersen, NA, Andersen, JC, Blanke, M, Heinemann, O, Nielsen, J, Pedersen, SM, Madsen, TE, Ravn, O & Wulfsohn, D 2009, ‘Safe and Reliable - Further Development of a Field Robot’. In Proceedings of the 7th European Conference on Precision Agriculture. Wageningen Academic Publishers, Wageningen pp. 857-866. Vandercasteelen, J, Dereje, M, Minten, B & Seyoum Taffesse, A 2014, Perceptions, impacts and rewards of row planting of teff, Discussion Paper no. 350, LICOS Centre for Institutions and Economic Performance, Leuven. Nicoullaud, B, Darthout, R & Duval, O 1995, Étude de l'enracinement du blé tendre d'hiver et du maïs dans les sols argilo-limoneux de Petite Beauce. Etude et Gestion des Sols vol. 2, no. 3, pp. 183–200. The System of Rice Intensification (SRI) is an evolving set of practices, principles, and philosophies aimed at increasing the productivity of irrigated rice by improving the management of plants, soil, water and nutrients, for example by increasing the space‎ between rice plants. With SRI, the soil is kept alternately dry and wet, allowing the plants’ roots to take oxygen from the ground surface. Seedlings are transplanted very young, in square patterns to allow enough spacing between the rice plants. These measures enhance the roots’ growth and increase yields. 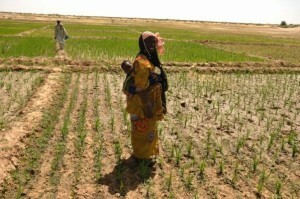 The Better U Foundation and Africare set up a project to assess the performance of SRI during the 2008-2009 growing season in 12 villages in the Dire and Goundam administrative circles of north central Mali. At the time, 19,000ha of land were under rice cultivation across the 12 villages managed by 17,200 households. Africare supplied each village with 2 rotary weeders and 1 field agent for every 15 farmers for technical support. SRI seedlings were transplanted 10-12 days after germination. In the control plots, seedlings were transplanted on average 29 days after germination with 2 to 5 seedlings in each pocket. Across all 12 villages, the results showed a yield improvement and cost benefit for adopting SRI. Seed usage decreased from 50kg per hectare to 6kg per hectare. Performance varied according to soil types, rice varieties, fertiliser regimes and weeding practices, but the average SRI yield for the 53 farmers who used the practices as recommended was 9.1 tonnes per hectare, 66% higher than the average for the control plots at 5.5 tonnes per hectare. The average yield on neighbouring rice fields where non-participating farmers used their own methods was 4.86 tonnes per hectare. SRI also has limitations. For the participating farmers, labour increased from 161 to 251 person days and input costs were higher, increasing from CFA414,650 ($714 US) in the control group to CFA476,580 ($820 US) for SRI. On the other hand, the net revenue from SRI more than doubled: CFA1,024,920 ($1765 US) per hectare for those that adopted SRI compared to CFA491,200 ($846 US) per hectare for the control plots. International Rice Research Institute (IRRI) (no date). Systems of Rice Intensification. [20 June 2015]. 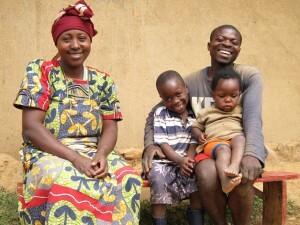 Everest and Joyce are a young farming couple living in Kagabiro village, Rwanda. They grow maize, beans, coffee, and bananas, but for years their efforts were unsuccessful. From 30kg of bean seed, they only harvested a meagre 40-50kg. To receive training, support and access to inputs, they decided to join the One Acre Fund. In her first season with One Acre Fund, Joyce planted 2kg of beans, and harvested 100kg, one of her best harvests ever. She attributes the increase in her harvest to the quality bean seed and the training she received that taught her how to plant beans in rows, and how to space her seeds‎ along those rows. One Acre Fund provides a planting kit to farmers that costs a little over US$0.50. By planting seeds correctly, farmers can improve their maize yields by 10%, representing a US$30 increase in income. The kit contains a fertiliser scoop for microdosing, a planting string and a top dressing stick. The planting string is 40 metres long with spray-painted markings every 25cm to mark where each seed should be planted. The string is faceted at each end between two sticks. This solves a major problem with inappropriate spacing, whereby farmers typically just drop seeds as they walk along the row, more or less dropping one seed per stride, but rarely with any consistency. The top dressing stick is a 75cm long pipe with a large nail drilled through one end. The rod serves to measure the proper distance between rows (75cm), by placing the rod on the soil to mark where the next row should start. The nail is used to create a hole several centimetres from the stalk where the fertiliser is applied. Using the One Acre Fund planting method, Joyce was able to store the beans at home to feed her 3 children. During the same season, Joyce and Everest also planted maize. They used the One Acre Fund planting method for spacing their maize seeds in the field, and they applied microdoses of fertiliser to each individual seed hole. They produced their largest harvest ever and sold their surplus maize for RwF50,000 (US$83). Row planting is one of the improved techniques that the Alliance for a Green Revolution in Africa (AGRA) teaches in Rwanda. Nyiranikubwayo Illuminee is a farmer in the Mukama Sector of Nyagatare District who was trained in best agronomic practices alongside other farmers in her cooperative by the Rwanda Development Organisation (RDO). These approaches include how to properly space seeds for optimum results, as well as how to rotate crops and use fertilisers in a targeted manner. The season following the training, she achieved her best maize crop and sold the 4 tonnes raised on her 2ha plot for CFA12 million (US$1,628). Aberto Pinto is a member of a group of 500 lead farmers in Mozambique selected by the International Fertilizer Development Centre (IFDC) and trained to grow a new improved cassava variety in Murupula. He has a 5ha farm and typically harvests 7 tonnes of cassava per season. Previously he would sell 2 tonnes of his harvest for US$50 per tonne. Through an AGRA-supported programme, IFDC provided him with disease-resistant cassava cuttings free of charge, and trained him in proper plant spacing techniques amongst other practices such as land preparation, soil management and managing or caring for plant cuttings. In the first year he received 510 cuttings, which he planted on 0.6ha at a distribution equivalent to 10,140 seedlings per hectare. From these, he yielded 10 tonnes of tubers. He sold half of his harvest to a beer brewing company, through market linkages fostered by an AGRA-improved value chain, at a price of US$250 per tonne. Alliance for a Green Revolution in Africa (AGRA) 2015, Transformed livelihoods: AGRA’s impact in Africa, AGRA Impact Report, Nairobi [24 June 2015].